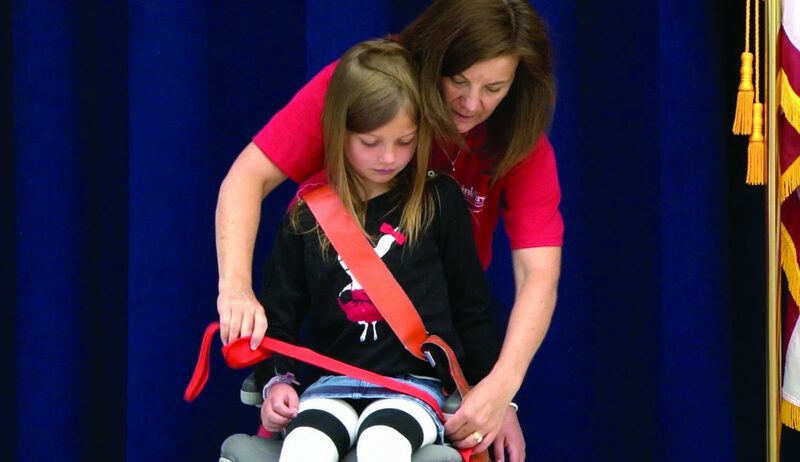 THINKFIRST demonstrates the importance of wearing a properly adjusted seatbelt. In a community like Summit County, where residents and visitors have high expectations for world-class services, sometimes it takes an army to provide them. Health care is an important area where outside support, such as philanthropic donors, grants and nonprofit organizations, makes a huge difference. With a relatively small patient population, St. Anthony Summit Medical Center often looks to the donors giving to Summit Medical Center Health Foundation to make programs and services possible that you wouldn’t expect to find in a small community, said Kelly Hall, the foundation’s development officer. “Our primary focus is fundraising for projects within the hospital — everything from specialty equipment and capital projects to community-focused programming outside the hospital,” she said. She’s especially proud of programs like ThinkFirst, a local chapter of the National Injury Prevention Foundation, which wouldn’t be possible without donor support. Since its inception in Summit County in 1999, ThinkFirst has worked to educate local youth and the community about brain and spinal cord injury prevention. ThinkFirst spreads that message through age-appropriate, interactive presentations in Summit County schools. For high school students, guest speakers who have suffered serious brain or spinal injuries share their stories and advice. All evidence points toward a program that is making a positive impact. Adnan said there has been a considerable increase in the use of helmets in the community. “Our research and data demonstrate that our program is effective in educating our youth and community in the prevention of brain and spinal cord injuries,” she said. Hall said the data suggests that the number of incidents and the degree of incidents are going down. She also points toward an encouraging “trickle-up effect,” in which parents who might not have previously worn helmets are learning from their children and following suit. The community impact is something that caught the eye of Nicky DeFord, Vail Resorts’ director of community engagement. The company is supporting ThinkFirst through Epic Promise, its charitable giving arm, because it so closely aligns with its mission to support youth programs and strengthen communities. In resort communities with hundreds of nonprofits, Vail Resorts has to remain selective in which causes it supports. DeFord said that Epic Promise reviews each program or organization looking for support to determine if it’s truly a community priority. They gather feedback from community leaders and Vail Resorts employees to make sure the community needs are being met and that the impacts are broad-reaching. “The formula they developed at St. Anthony (Summit Medical Center) is really having an impact,” she said. That’s something Hall takes to heart. She said one of the things she’s most proud of is that Summit Medical Center Health Foundation’s funds go toward programming, not salaries or overhead. “If you want to fund the purchase of helmets, I can tell you exactly how many helmets we buy because we can track those dollars,” Hall said.